Recommended Name: � the Castilian pattern. This pattern was originally classified as S-6. This design was launched under the direction of Heraclio Fournier in 1889 and has featured predominantly in the Fournier family's output ever since. It is the firm's own choice to describe it and similar designs as "Castilian", although its actual place of production has always been Vitoria in the Basque province of Alava. This positive attempt to revise the design of the Spanish pack was combined with an early enthusiasm for the use of lithography, which further contributed to its characteristic appearance. A double-headed (reversible) version has recently been tried. During the first half of the 20th century the firm of Fournier eclipsed virtually all competition within Spain, so the design remained their exclusive property there with the exception of packs of arguably similar flavour by Comas and Roura. The identical design has, however, been copied by several foreign firms. Other designs, while not exact copies, were undoubtedly influenced by this pattern. All the kings are heavily bearded and all wear or carry swords; there is an emphasis on heavily decorated robes. No horses are rearing; all are elaborately caparisoned. 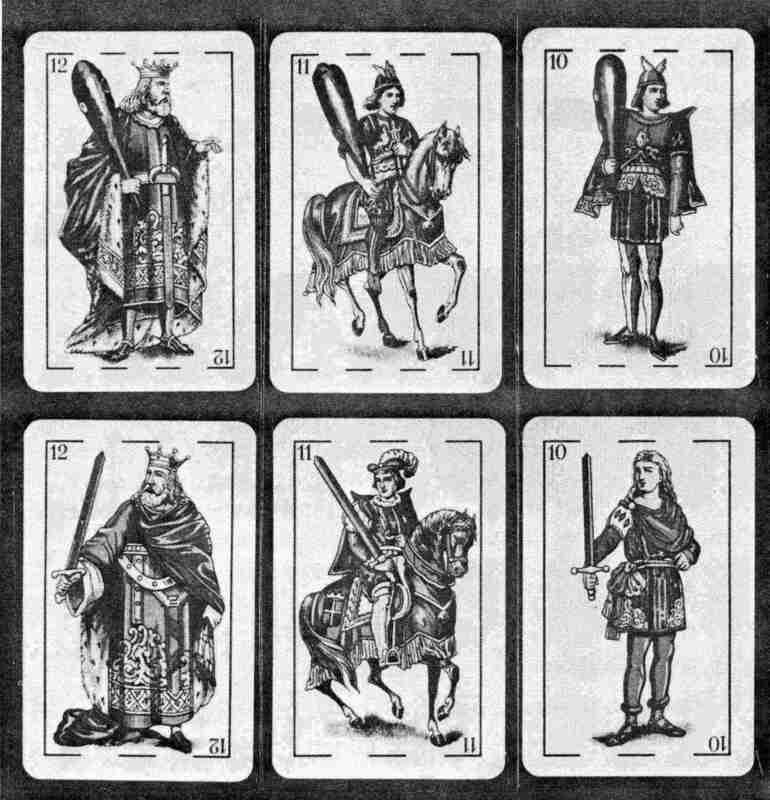 No kings have sceptres; the king of batons is in profile, the cavalier of the same suit has no stirrups. The clubs of the batons suit are uniform in shape throughout. Ace of coins: coin has profile portrait, the surround is packed with symbolic flags, palms, etc. Heraclio Fournier, Vitoria, 1889 to present day. Anonymous ("Espanolitas"), probably Hong Kong; all 20th Century. 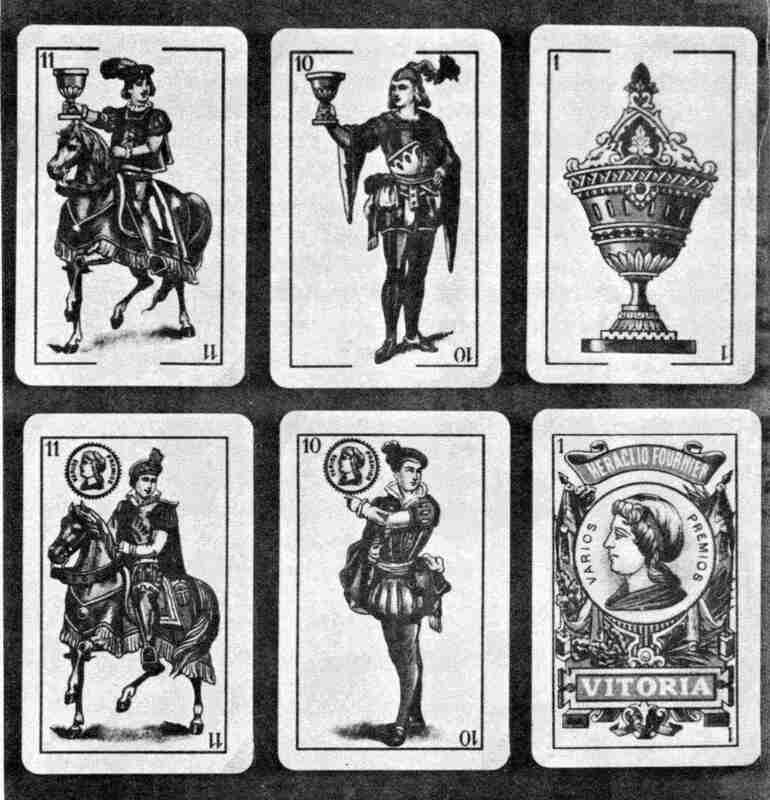 Cards made by Hijos de Heraclio Fournier, Vitoria, 1945.